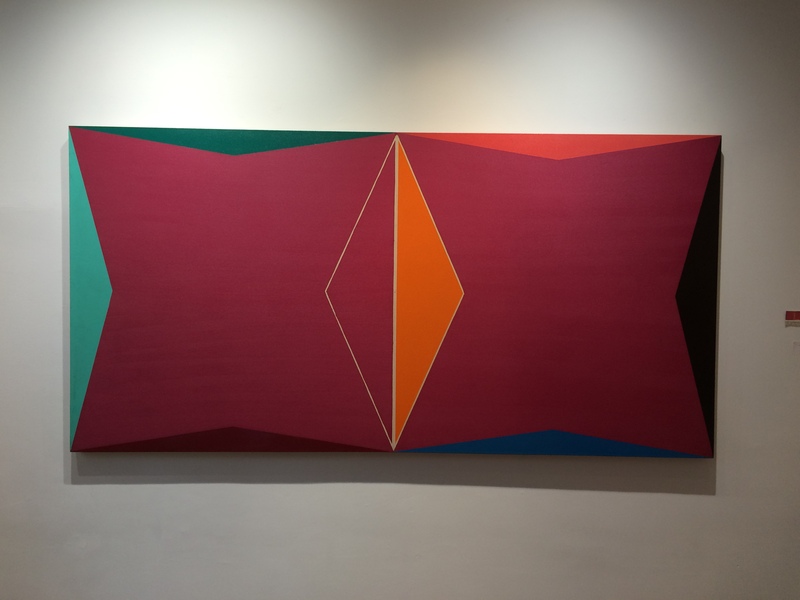 The exhibition “LARRY ZOX: Master of Color and Form” is currently on display at the STUX + HALLER located at 57th street in Midtown Manhattan. This neighborhood has a number of blue chip galleries that show the work of established and often historically significant artists. Zox’s acrylic paintings from the late 1960’s are all about hard edge geometry on a flat plane. This large scale rectangular canvas has adjacent sides in a 2:1, ratio creating a format consisting of two equal squares. From each side of the squares an obtuse isosceles triangle has bee drawn. An obtuse isosceles triangle has two sides and two angles of equal measure, and the third angle measures over over 90 degrees. All Isosceles triangle have a line of reflection symmetry. The triangles with vertical bases have a greater height than the triangles with horizontal bases. This gives the illusion of stretching the plan across the canvas. All but one of the triangles have been painted a different color than the central form. The left central vertical triangle is only defined by a white line outline. This painting is a very important piece, MOMA owns a similar work from this series. It is quite gratifying to be able to enjoy it in an intimate gallery setting.